Buddy came to the Abilene Pipers from New Orleans. 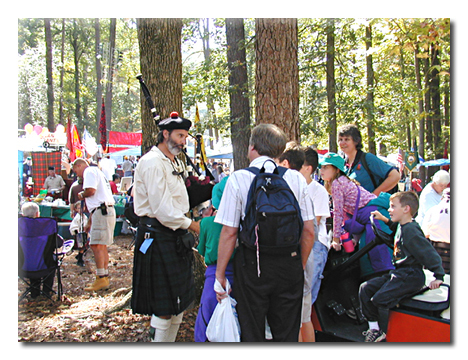 He was a member of the Kilts of Many Colors Pipes and Drums. Buddy has played for Burns Suppers, Christmas Parties, Parades, Weddings, Funerals and too many other functions to name. He is currently decreasing our country's reliance on fossil fuels by building windmills all over the US. the pipes by watching performances by some of the world's greatest pipers on movies and on TV, along with his strong Scottish family background, but it wasn't until he watched Eric Rigler pipe at Ronald Reagan's funeral that he decided to play. He has performed for local funerals, parades, school sanctioned events, Abilene Art Walk and the 2005 De Leon Peach and Melon Festival.